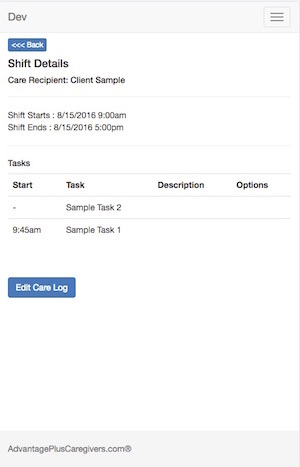 You MUST first be registered with us as a caregiver or a staff member and get your log on credentials in order to use our smartphone APC App. The application will work of all types of modern smartphones like iPhone, Android phones and Windows 10 Mobile, but you can use it also on your tablet, laptop or desktop computer. After your initial log in, it should log you in automatically every time you open the APC icon. 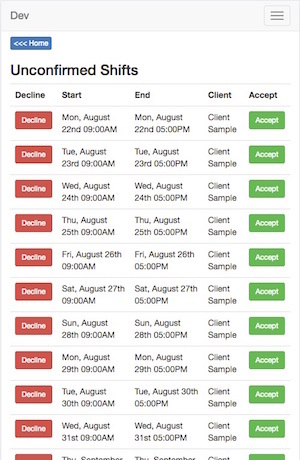 Once logged on you should be able to see your proposed schedule awaiting your confirmation (see below). You must confirm each day that you are going to be working. 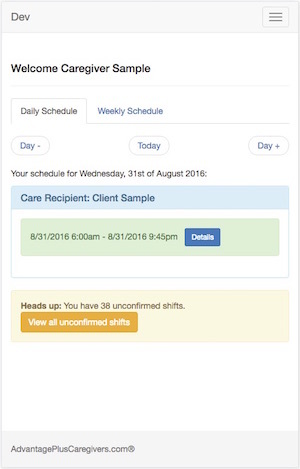 Once confirmed you then wait to check in on the date and time of the schedule (you will only be able to check in while you are at the care recipient's location, that is determined by your GPS feature in your smartphone so that must be on). 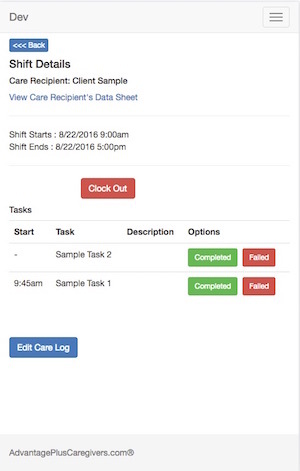 After you check in you will be able to reach the care recipient's chart, including preferences and daily routines, along with previous care notes. 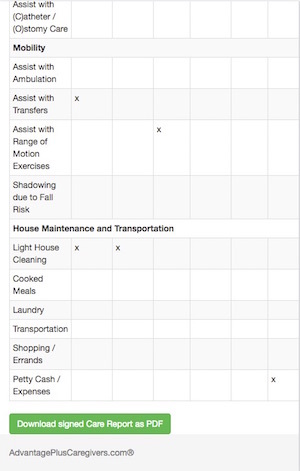 You may have some additional tasks added to your day and you will be able to fill your “Care Notes” as you are doing them or at the end of the day before you “check out”. When you leave the care recipient's home you will no longer be able to see their view. If you want further assistance, please call or come in and we will help you! 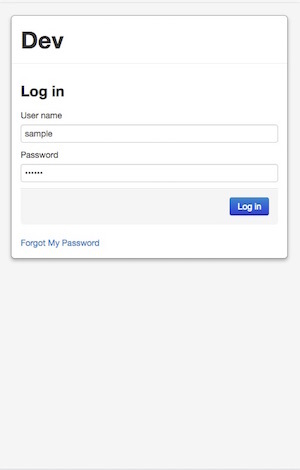 When you open the application, it will ask for your User name and password. To get that call the office. 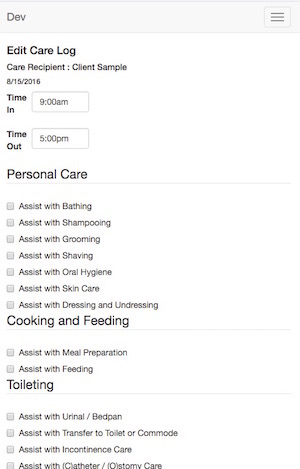 By default you will see your schedule for today and you can navigate forward or backward with the Day+, Day- buttons. At the Bottom of the screen you can see the number of your unconfirmed schedules. By default you will see your schedule for the current week and you can navigate forward or backward with the Week+, Week- buttons. 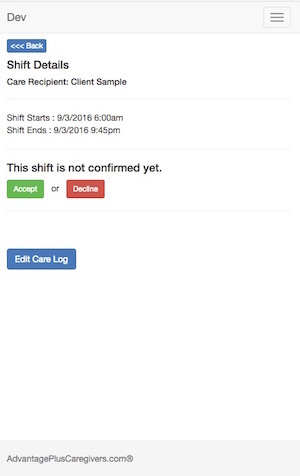 Click on the Accept button if you agree to work, or Decline button, if you don't accept the shift. 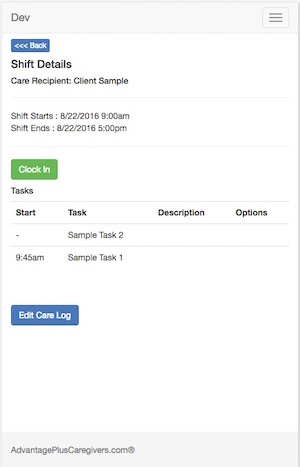 On this screen you can see the details of the shift, including the tasks you have for that particular shift. If the shift you are viewing has not been confirmed yet, you can either accept or decline it. 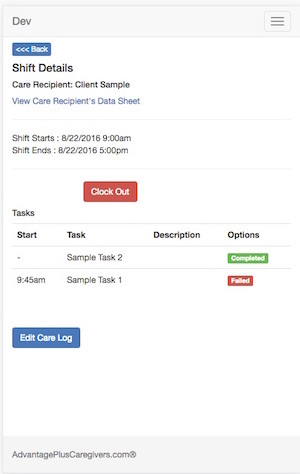 This is the screen for filling out care logs. 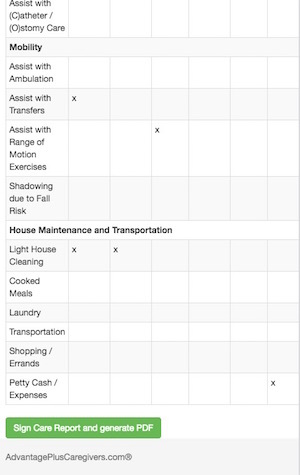 Only check the things that you actually did for the Care Recipient. 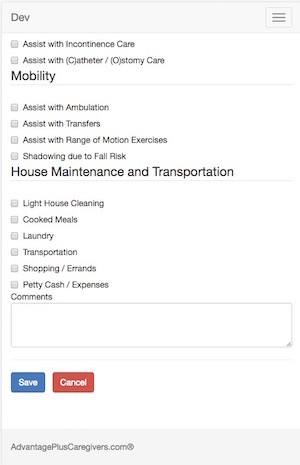 You have an additional Comment field at the end of the care log to fill out for anything else that you think we should know regarding the care. 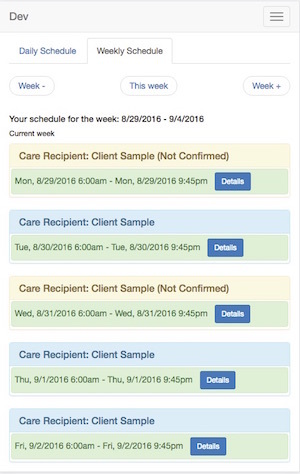 Once you clock in, you will be able to view the care recipient's plan of care, daily route and personal preferences. 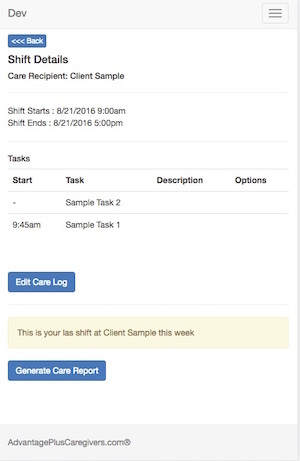 Before generating the Weekly Care Report, the program will ask you to confirm. 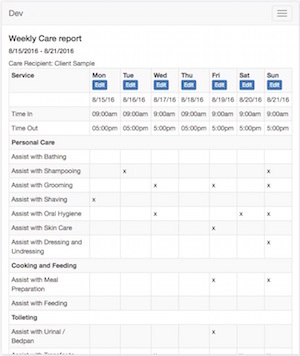 You can see the whole week on a screen, and you can change the details for each day by clicking the Edit button on the top of each column of the report. 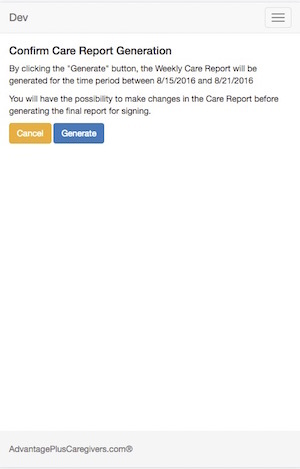 When the Weekly Care Report is done, you can finalize the report and sign it on the screen of the mobile phone by clicking the Sign Care Report and Generate PDF button. You can sign the report with your finger, using a stylus, or with the mouse if you are on a computer. There is a box for the signature of the Care Recipient too. 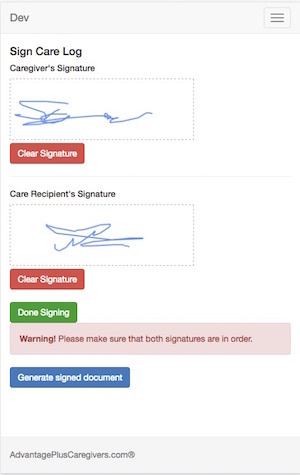 After the report is signed, you can generate the signed document in PDF format. 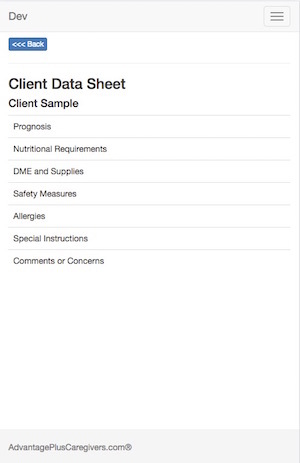 After the Report has been generated, you can download it to your mobile or computer. And then send it a an attachment to the office.